After an eventful fallout with the national randonneuring 'body', a number of clubs (both clubs of Bangalore included) are no longer organising ACP sanctioned rides this year. Instead, a new organisation is taking shape in Bangalore, and there could hardly be a more fitting first ride than the K200 - a scenic and challenging route with just the right mix of everything. I was up by 4am, and out of campus at 5, riding with Sourav. On the way I noticed the brakes getting weaker and noisier, and by the time I reached the start I was in no mood to take chances. I helped out at the start - which went smoothly thanks to a nice queue system despite over 70 starters and 100 registrants. Sandeep kindly allowed me to join the organisers' ride the subsequent day, so after the volunteers' breakfast I got back and fixed up the bike. A 6 AM start 15km away meant waking up at 4 AM, but in hindsight it can be a blessing too - some easy riding to warm up before the actual start, and a quick check of all systems. I carried some Panjiri Laddus to the start, great chunks of carbs to last till breakfast. There was a slight drizzle at times - more irritating was the fine spray created by passing vehicles. Traffic was light and we reached Saravana Bhavan at nearly 25kmh average. Try the Paper Masala Dosa - it is massive! 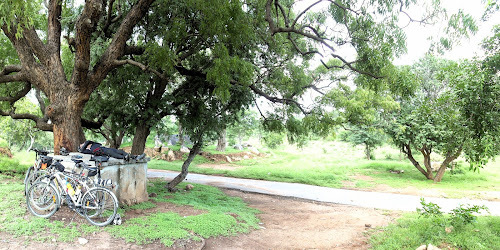 Krishnagiri and the first control were passed in no time, and the route continued to descend till the bridge over the Ponnaiyar. Once the climbing began, I could not keep up with the other three, partly because of the heat and humidity, and partly because of the huge dosa! A short 5 minute break helped, and I tried to make sure I kept moving. The climbs were mostly gentle but relentless, and there were many false flats. One one of the really steep sections I hopped off and pushed the bike up. The 20k to Rayakottai took nearly two hours - but luckily I did not realise this at the time. I did not find the others waiting the the exit from Rayakottai - so I figured they were probably too far ahead. From Rayakottai onwards the road is really much more beautiful. Or maybe I was feeling much better now that the Dosa and Pongal had now gotten around to doing their job. Unfortunately I could not take photos of the best parts either because I was speeding downhill or puffing uphill. I figured the lead trio would be in Denkanikottai by now, but they were waiting for me at Anusonai, where we had some biscuits and soft drinks, and topped up our bottles. 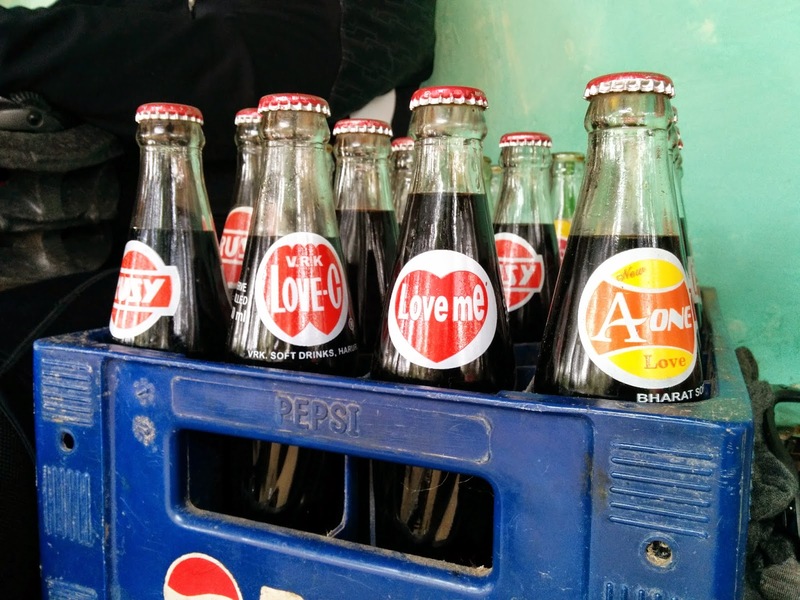 Rusy, Love mE, Love-C, A One Love, and (not visible) Sun Cola. Be not hasty, dear reader, in dismissing these local drinks -some of them are quite tasty. I had been told the road hereafter was bad, but good and bad are relative terms - it was patchy and uneven, and potholed in places, but certainly not enough take the attention away from the superb scenery around. Rorschach Test - what do you see in this photo? At 132 km there is a hill on the left side. We had loads of time, so Karthikeyan and Shaunak trekked all the way to the top, while Sandeep and I rested below. the intricacies of randonneuring to some curious local. We were in Denkanikottai by 3PM. Karthikeyan's favourite darshini was closed on account of it being sunday, so we went to a bakery instead. Some hot Dilpasand, Egg puffs and Mysore Pak, and we set off again. As usual I struggled to keep up for a while, then fell behind, catching up at Attibele. One dry-fruits milkshake (topped with honey) at Attibele for the remaining 20k, and one brief halt to put on reflective vests and lights. Sandeep guided us superbly - correctly telling us when to switch in and out of the service lane. Traffic was relatively tame, and we managed to reach the end control by 6:40PM. After the brief formalities of submitting the cards, Shaunak and I started the hardest segment of the ride - getting back to IISc. By the time I got back I could barely keep my eyes open, but I forced myself to stay awake and eat a proper dinner to meet the post ride carb requirment. A good night's sleep and I'm feeling in good shape. 1. Keep moving. You may be going 5km/h in a headwind, or even walking up an ascent, but you are moving. If you stop you're going nowhere. 2. If you feel like you absolutely can't go on, if you feel like quitting, do three things. Eat something, drink something, and rest/sleep for a bit. In all probability you will feel much better and able to continue.